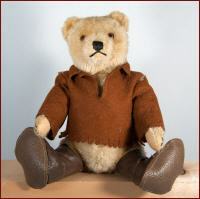 Dieser wunderbar ausdrucksvolle und höchst seltene Steiff Teddybär ist einer von den echten Nimrod Teddys die nur 1953/1954 hergestellt worden sind! Von diesen Bären wurden damals weniger als 4'500 Stück hergestellt, entsprechend selten sind sie heute zu finden. Dieser Nimrod Teddy ist ca. 21cm gross und 5-fach gegliedert. Er befindet sich in leicht bespieltem Zustand, aber er ist sauber und Geruchsneutral. Seine braun hintermalten Augen sind aus Glas, die Nase und Krallen sind mit schwarzem Garn gestickt und er hat eine funktionierende Druckstimme im Bauch. 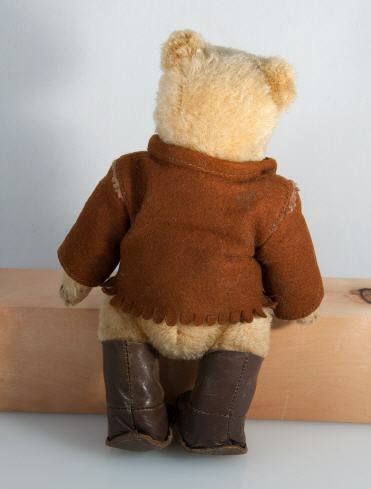 Er trägt noch seine originale braune Filzweste sowie die braunen Lederstiefel. Gewehr und Hut hat er verloren. 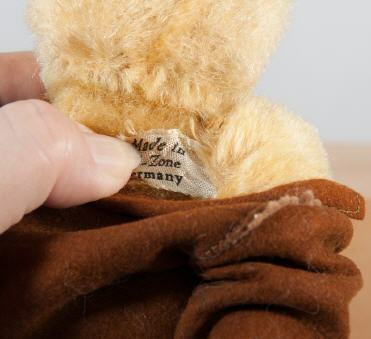 Auch hat er keinen Steiffknopf mehr, aber dafür besitzt er noch eine US-Zonen Fahne unter dem rechten Arm sodass man ihn definitiv als original aus der Zeit identifizieren kann. This wonderfully expressive and extremely rare Steiff teddy bear is one of the real Nimrod teddies which have been produced only 1953/1954! Of these bears that time were less than 4,500 pieces manufactured, according rare they can be found today. 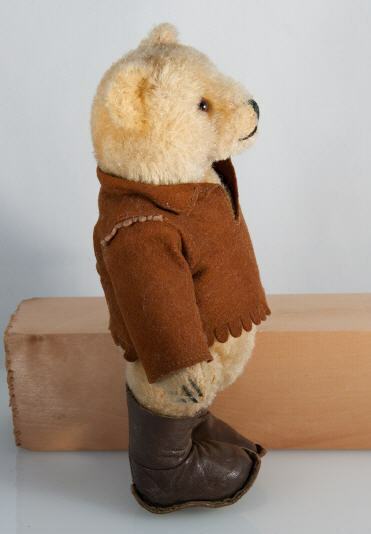 This Nimrod Teddy is about a 21cm high and 5 way jointed. He is in easily played with condition, but he is clean and odorless. 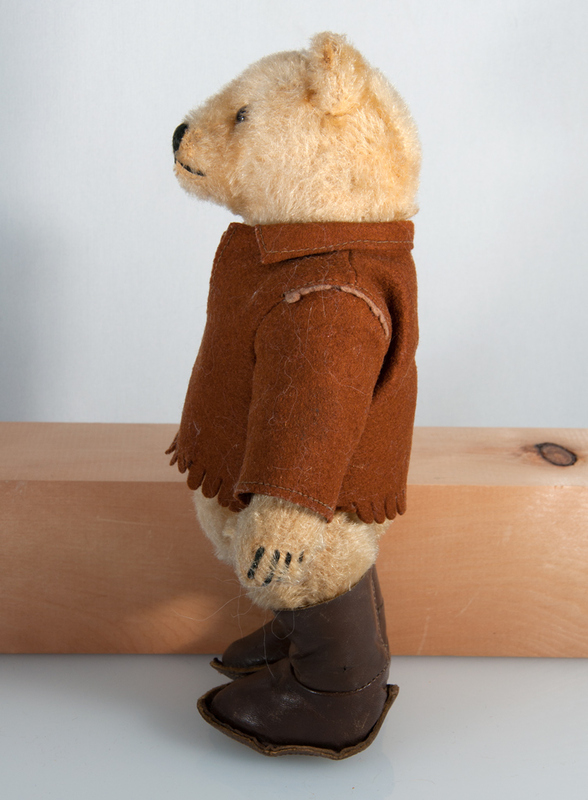 His brown eyes are made of brown back-painted glass, the nose and claws are embroidered with black thread and he has a still working pressure voice in the abdomen. He still bears its original brown felt waistcoat and brown leather boots. Gun and hat he lost. 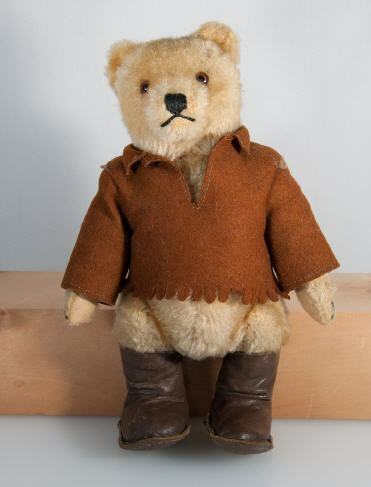 He also has no more Steiff button, but he still has a US-Zone flag under the right arm so you can definitely identify him as an original from the period.